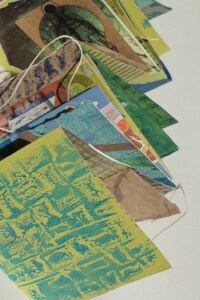 Private Book Arts Workshop – Wednesday, November 12, 2014 – Spend the day making unique artist’s books with Cristina. 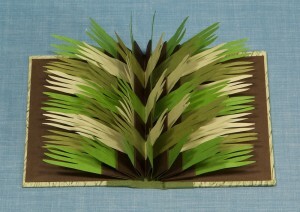 Flag books have wonderful sculptural possibilities. With multiple angles of view, they provide interesting double narrative potentials, contrasting viewpoints, or “yin and yang”, if you will. There so many approaches to content. Excellent for creative poetry, wish lists, sweet nothings, photographs, abstract designs, and more! 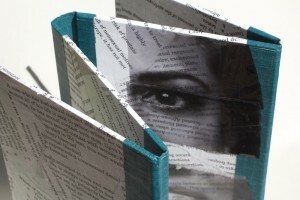 An altered book is “any book, old or new, that has been recycled by creative means into a work of art.” With no rules, the possibilities are only limited by your own imagination. The book becomes a canvas, a sculpture or a reliquary of personally meaningful content. Draw inspiration from the book’s original author or purely use the book as a structure. 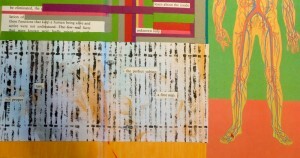 Interesting altered book choices will be provided, in addition to selections from your home library. An altered book is “any book, old or new, that has been recycled by creative means into a work of art.” With no rules, the possibilities are only limited by your own imagination. The book becomes a canvas, a sculpture or a reliquary of personally meaningful content. Draw inspiration from the book’s original author or purely use the book as a structure.